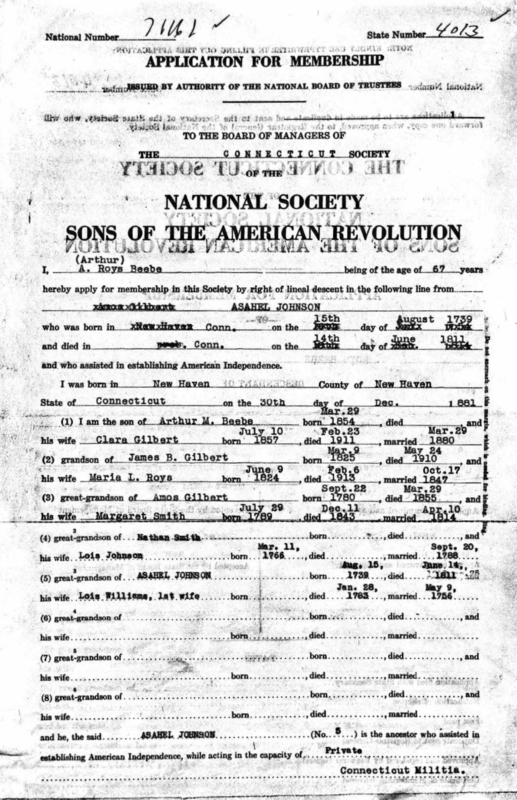 "United States Census, 1920," database with images, FamilySearch (https://familysearch.org/ark:/61903/1:1:MCNV-K1S : 14 December 2015), Arthur M Beebe, New Haven Ward 10, New Haven, Connecticut, United States; citing sheet 6A, NARA microfilm publication T625 (Washington D.C.: National Archives and Records Administration, n.d.); FHL microfilm 1,820,193. Selective Service System United States, Selective Service Registration Cards, World War II: Fourth Registration, National Archives and Records Administration Region Branches, , New York > B > Beach, Chester Arthur - Benemio, Michael > 1425. "Connecticut, Death Index, 1949-2001," index, FamilySearch (https://familysearch.org/pal:/MM9.1.1/VZPP-PT8 : accessed 09 May 2014), Arthur M Beebe, 25 Mar 1951; citing "Connecticut, Death Index, 1949-2001," Ancestry.com; Pomfret, Windham, Connecticut, Department of Health, Hartford. "United States Social Security Death Index," index, FamilySearch (https://familysearch.org/pal:/MM9.1.1/JKXY-2JH : accessed 07 Nov 2012), Arthur R Beebe, 12 October 1996; citing U.S. Social Security Administration, Death Master File, database (Alexandria, Virginia: National Technical Information Service, ongoing). 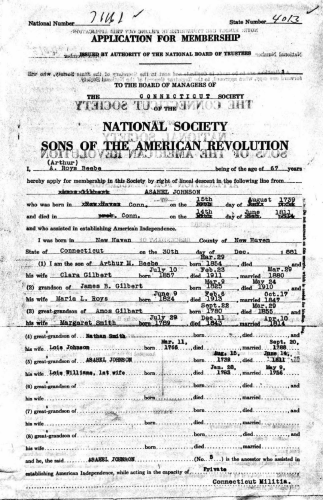 "New York, State Census, 1925," index, FamilySearch (https://familysearch.org/pal:/MM9.1.1/K9YF-H47 : accessed 07 Nov 2012), A Roys Beebe, 1925.
living at 400 58th Street, Manhattan, New York County, New York. Passenger and Crew Lists of Vessels Arriving at New York, New York, 1897-1957, Washington, D.C.: Records of the Immigration and Naturalization Service; National Archives, , Year: 1926; Arrival; Microfilm Serial: T715; Microfilm Roll: 3817; Line: 1; Page Number: 94. World War I Civilian Draft Registrations. [database on-line], Provo, UT: Ancestry.com, (2000) , Registration State: New York; Registration County: Franklin; Roll: 1712374; Draft Board: 2. Passenger and Crew Lists of Vessels Arriving at New York, New York, 1897-1957, Washington, D.C.: Records of the Immigration and Naturalization Service; National Archives, , Year: 1926; Arrival; Microfilm Serial: T715; Microfilm Roll: 3890; Line: 7; Page Number: 24. Passenger and Crew Lists of Vessels Arriving at New York, New York, 1897-1957, Washington, D.C.: Records of the Immigration and Naturalization Service; National Archives, , Year: 1926; Arrival; Microfilm Serial: T715; Microfilm Roll: 3979; Line: 23; Page Number: 42. Passenger and Crew Lists of Vessels Arriving at New York, New York, 1897-1957, Washington, D.C.: Records of the Immigration and Naturalization Service; National Archives, , Year: 1927; Arrival; Microfilm Serial: T715; Microfilm Roll: 4045; Line: 5; Page Number: 25. Passenger and Crew Lists of Vessels Arriving at New York, New York, 1897-1957, Washington, D.C.: Records of the Immigration and Naturalization Service; National Archives, , Year: 1928; Arrival; Microfilm Serial: T715; Microfilm Roll: 4320; Line: 4; Page Number: 154. Passenger and Crew Lists of Vessels Arriving at New York, New York, 1897-1957, Washington, D.C.: Records of the Immigration and Naturalization Service; National Archives, , Year: 1928; Arrival; Microfilm Serial: T715; Microfilm Roll: 4341; Line: 26; Page Number: 41. Passenger and Crew Lists of Vessels Arriving at New York, New York, 1897-1957, Washington, D.C.: Records of the Immigration and Naturalization Service; National Archives, , Year: 1929; Arrival; Microfilm Serial: T715; Microfilm Roll: 4434; Line: 14; Page Number: 15. Passenger and Crew Lists of Vessels Arriving at New York, New York, 1897-1957, Washington, D.C.: Records of the Immigration and Naturalization Service; National Archives, , Year: 1929; Arrival; Microfilm Serial: T715; Microfilm Roll: 4562; Line: 25; Page Number: 136. Passenger and Crew Lists of Vessels Arriving at New York, New York, 1897-1957, Washington, D.C.: Records of the Immigration and Naturalization Service; National Archives, , Year: 1929; Arrival; Microfilm Serial: T715; Microfilm Roll: 4638; Line: 9; Page Number: 134. 1930 United States. Bureau of the Census. 15th census, United States, 1930 federal census : population schedules ; NARA microfilm publication T626, Washington, District of Columbia: Bureau of the Census Micro-Film Laboratory, ([19--?]) , Census Place: Manhattan, New York, New York; Roll: 1564; Page: 30B; Enumeration District: 649; Image: 632.0; FHL microfilm: 2341299. Passenger and Crew Lists of Vessels Arriving at New York, New York, 1897-1957, Washington, D.C.: Records of the Immigration and Naturalization Service; National Archives, , Year: 1935; Arrival: New York, United States; Microfilm Serial: T715; Microfilm Roll: 5705; Line: 30; Page Number: 72. Sixteenth Census of the United States, 1940, Washington, D.C.: National Archives and Records Administration, (1940) , Census Place: New York, New York, New York; Roll: T627_2648; Page: 83A; Enumeration District: 31-1013. Connecticut Department of Health, Connecticut Death Index, 1949-2001, Hartford, CT: , State File #: 06199. 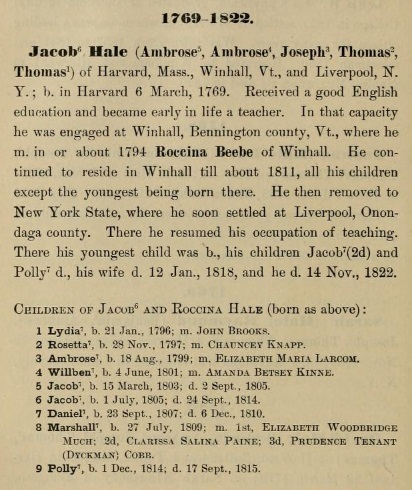 Roccina Beebe was born perhaps about 1787. Rev. Roselle Theodore Cross, My Children's Ancestors: Data Concerning about Four Hundred New England Ancestors of the Children of Roselle Theodore Cross and His Wife Emma Asenath (Bridgman) Cross, , at http://books.google.com/books?id=LIPhAAAAMAAJ . Columbus, Ohio: Champlin Press, (1913) , p. 156. Concord, Massachusetts Births, Marriages, and Deaths 1635-1850, , at https://books.google.com/books?id=vs8UAAAAYAAJ . Boston: Beacon Press, ([1891?]) , Vol. 1, p. 110. Bell, Leonard. cooper, 1 Main st.
Bell, Leonard jr. farmer, 1 Main st.
Bell, Leonard. painter - 18 Main. 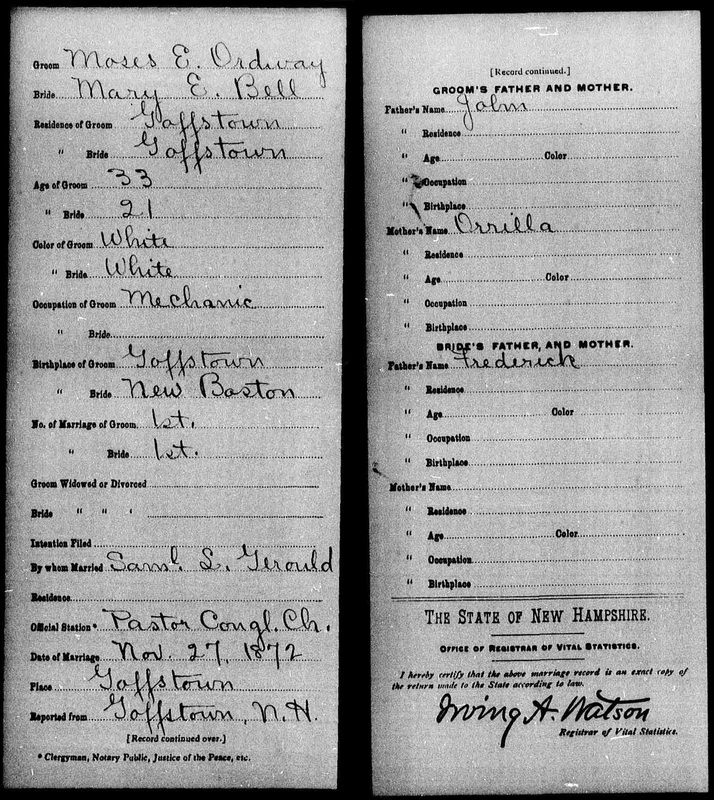 "New Hampshire, Deaths and Burials, 1784-1949," index, FamilySearch (https://familysearch.org/pal:/MM9.1.1/FDKV-J8N : accessed 21 February 2015), Mary Ordway, 03 Jul 1875; citing Goffstown, Hillsborough, New Hampshire; FHL microfilm 2,168,794. Personals, The Portsmouth N.H. Herald, Portsmouth N.H., July 28, 1939, p. 14. 1890 census of Civil War Veterans., , 345/350. 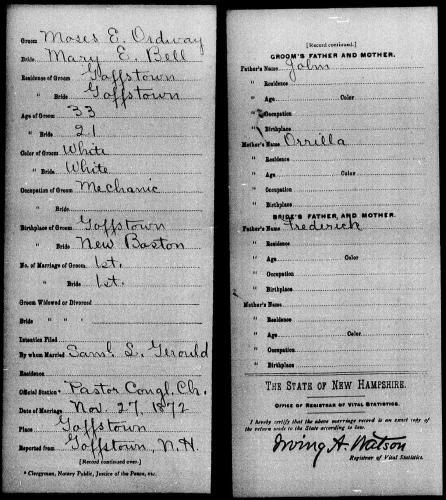 "Massachusetts Births, 1841-1915", database with images, FamilySearch (https://familysearch.org/ark:/61903/1:1:FX6Q-1M4 : 1 March 2016), Joseph Roy Bennett, 1887.